17-10-2014, 13:01 - NEW MSX E-BOOK? 14-06-2013, 16:42 - Ebay - Very Rare last 19 Hours! 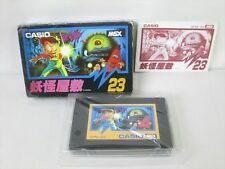 25-04-2013, 21:38 - VERY RARE: PUYO PUYO ✩ STRIKE MISSION ✩ STAR FIGHTER ✩ UMI YUKABA MSX LD ✩ AND OTHER AUCTIONS!!! 08-03-2013, 21:53 - ✩ ARKANOID II ✩ R-TYPE ✩ DEZENI LAND ✩ and other games! 16-02-2013, 15:07 - ✩ ALESTE GAIDEN ✩ - Disc Station Special 4 - Autumn Edition - ✩ R-Type ✩ - VERY RARE SHMUP! & more!!! 17-09-2004, 17:11 - Last MSX game? 17-09-2004, 16:02 - Last MSX game?